Early in 2017, I picked up a copy of Warhammer Quest: Silver Tower…and began my relationship with Games Workshop’s Age of Sigmar setting. I was initially put off of Age of Sigmar after the destruction of the beloved Old World, but have became a bigger fan of this new setting than I was of the former one. It seemed some of my enthusiasm splashed onto my son as he got the bug as well and wanted to paint up some Stormcast. A buddy hooked us up on a fantastic deal on an AoS Starter set with the Stormcast side mostly painted. My son was in luck! I, however, needed to get to work. 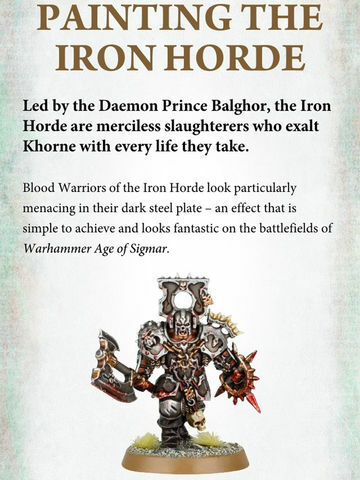 Khorne was never one of my favored chaos gods, even in the Old World. 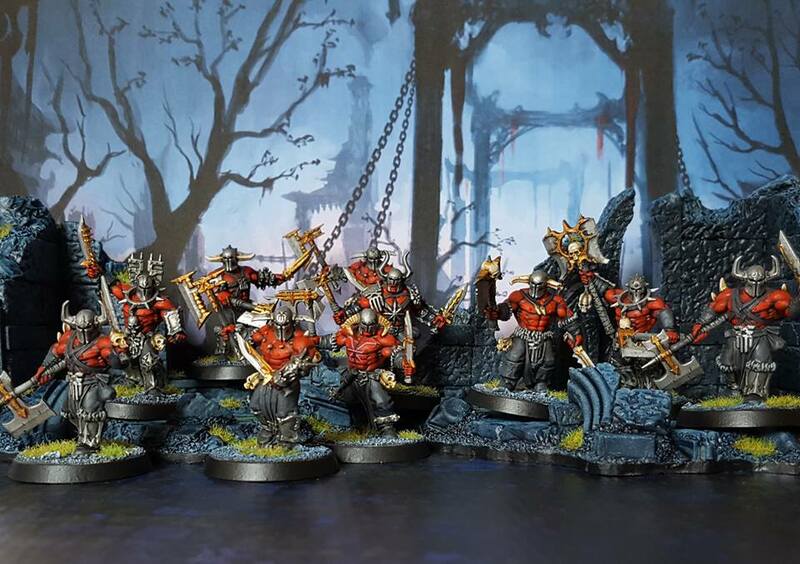 Truth be told I was never too in to Chaos of any flavor, so when I found myself with a decent sized force of blood craving lunatics, that I need to get painted so my son could battle, I did the most sensible thing…find the easiest paint scheme to get this task over with. I found the above color scheme online, and it looked to be as simple as an entire outfit of grey and iron. Very easy to paint and hard to mess up. I did want a little splash of color, but I’m not a fan of having all the weapons bloody. Remember, I’m playing this with kids mainly (for the moment). However, I was inspired to move the red color to the skin, which would give the model its needed contrast, as well as provide a ‘pop’ against all the grey and metal. 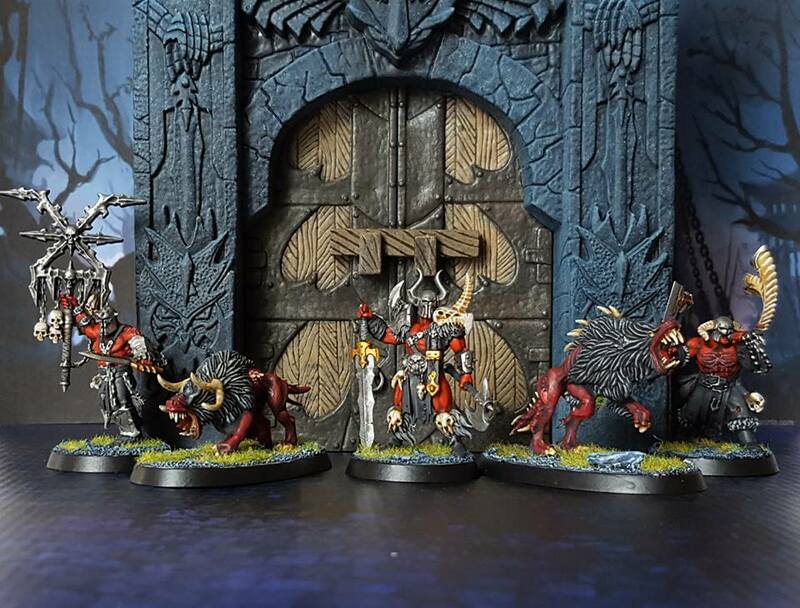 It took about four months but now…the Bloodskins of the Iron Keep are fully equipped and unleashed on the Mortal Realms. Bloodwolf, Chieftain of the Bloodskins, with his bloodhounds. 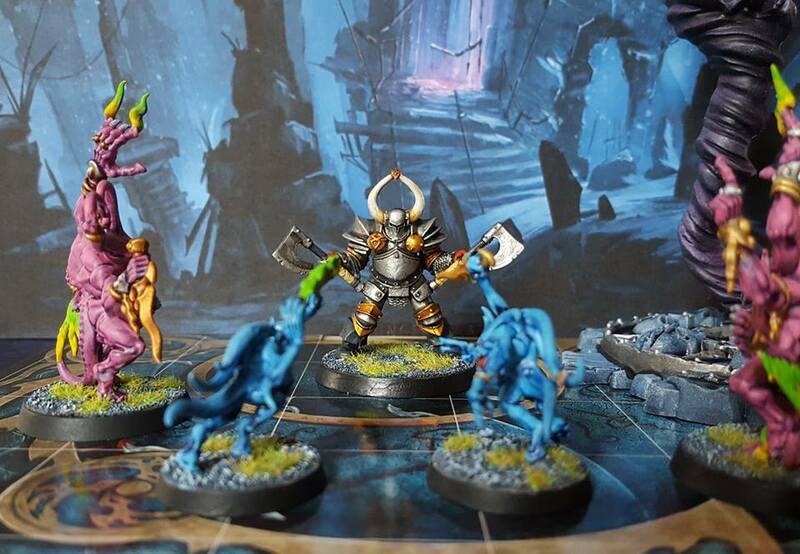 Bloodskin Slambo hunting the Gaunt Summoner in his Silver Tower. Though I was initially not too keen on painting these models…they grew on my over time and this has become one of my favorite hobby projects in recent years. I really like how their colors worked out with the only change I’d make being to the ‘Bloodgorath’ but my son really likes him being ‘Big Blue’. Keen observers may notice that all models have helmets. This was by design and some conversions where necessary. As mentioned in a previous post (regarding my Shadespire warband), faces aren’t y favorite thing to paint. Plus, it sort of helps unify the warband’s overall look. I’ve also omitted any chopped heads that some models were originally carrying. One, eh, that’s a bit grim for my gaming, but two…those were faces I didn’t want to paint! 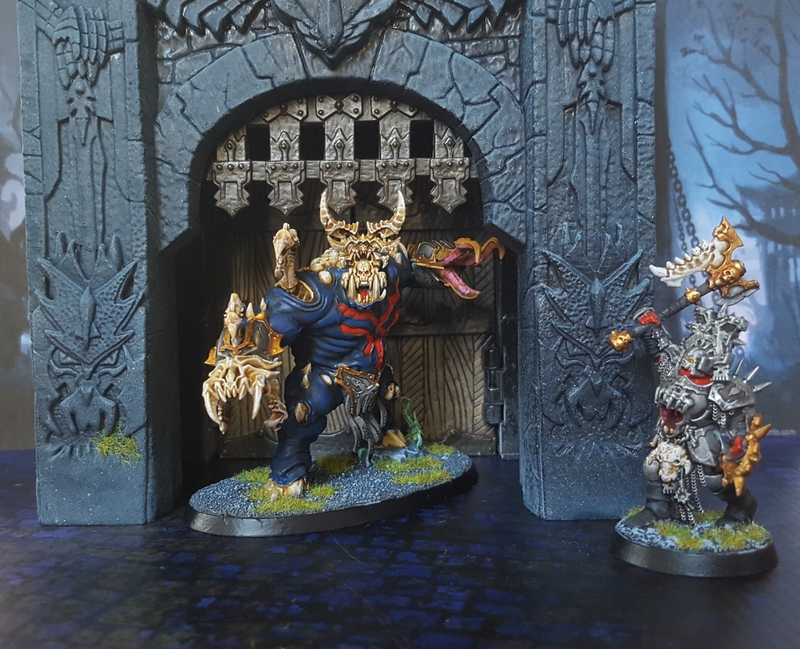 This entry was posted in Age of Sigmar, Gaming, Painting, Warhammer Quest and tagged Age of Sigmar, Games Workshop, Miniatures, Painting, Silver Tower, Warhammer Quest by Mr. White. Bookmark the permalink. 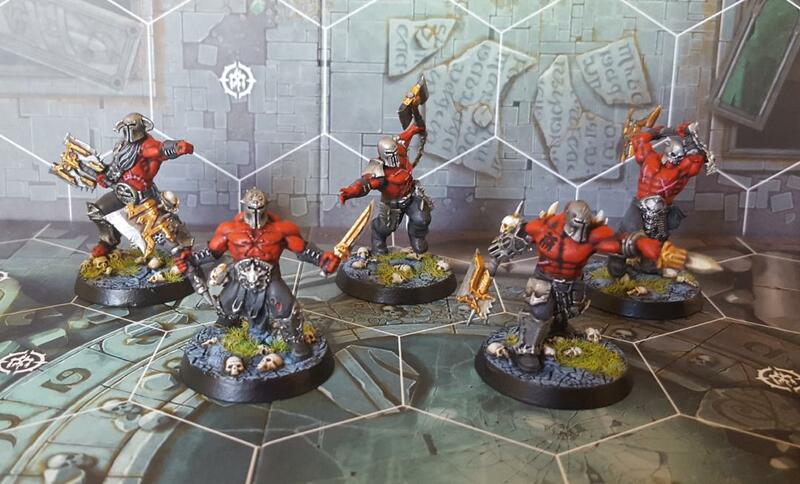 I like the red skin on the Bloodskins. I don’t know if that’s too literal of an approach (not knowing what color Bloodskin’s skin is supposed to be), but it sounds and looks good. 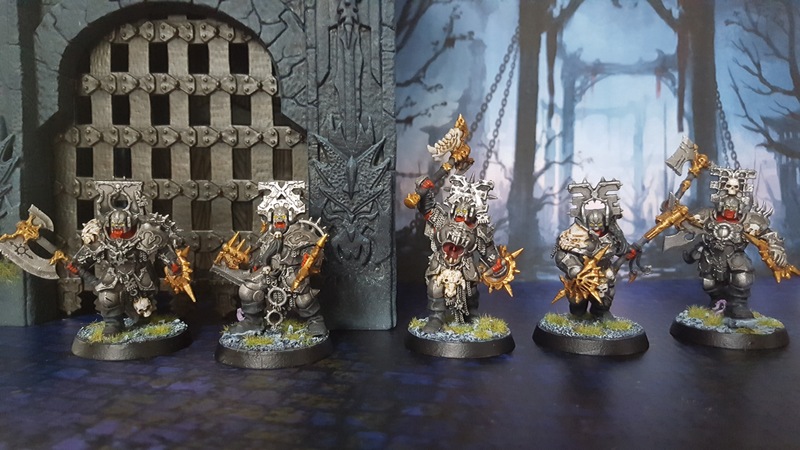 Especially with the grey, black, and metal colors of the models. I’m also not a fan of blood all over the weapons and models. It usually looks to fake or is distracting to me. I tend to go with ‘dried blood’, if I really feel like I need to add it. ‘Bloodskin’ is something I made up. 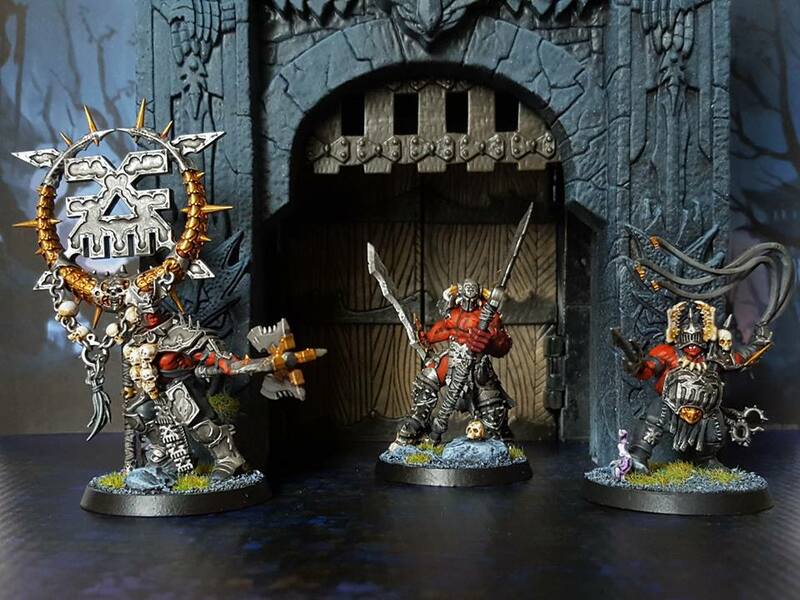 Not based on any ‘official’ Khorne flavor that I’m aware of. Yeah, that whole soak the mini in technical blood paint is a trend I’m not especially fond of. It covers up,or at best, distracts from the model and it’s paint job. Seems to be an overall -1 to the mini, IMHO.